Never deviating from its original concept of establishing a sparkling house to rival the wines of Champagne, Clover Hill solely produces Méthode Champenoise sparkling utilising the traditional ‘Trinity’ varietals; Chardonnay, Pinot Noir and Pinot Meunier. 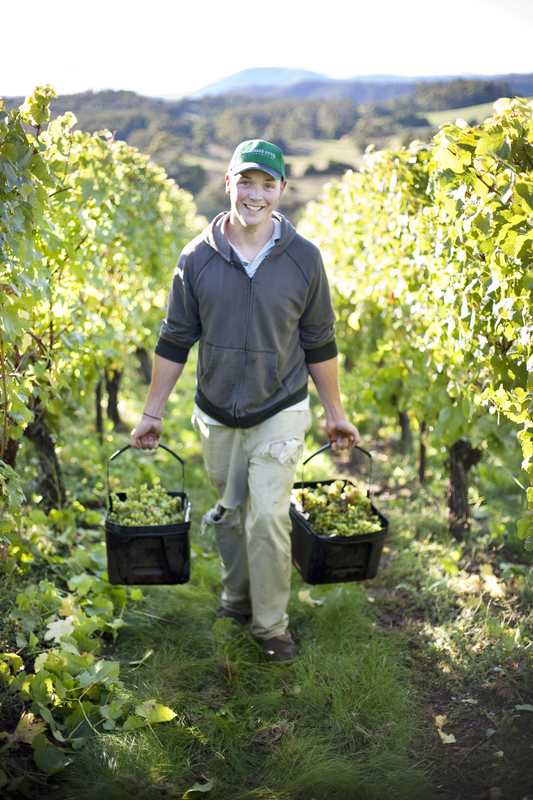 Chardonnay is a critical component of the Clover Hill style. Playing a distinct role in sparkling wines, Chardonnay imparts texture and flavour, and marries well with the other sparkling varietals. Rich and balanced Chardonnay is also a key component when ageing the wine and developing richness with extended time on lees. The inaugural 1991 Clover Hill wine was a Blanc de Blanc; a style of sparkling using 100% Chardonnay. Today, this style is re-produced in exceptional years as the Clover Hill Cuvée Exceptionnelle Blanc de Blancs – also forming the basis of the Late Disgorge Cuvée Prestige that is matured for over ten years. Pinot Noir provides the rich flavours and bright texture to sparkling wines. Picked after veraison, the red berries are immediately pressed to draw out the juice with all its flavour and zesty acid with only the slight blush of colour. Contributing complex aromatics, fruit flavours and persistent natural acid, Pinot Noir is used in the traditional blend to enrich the flavour of the palate while adding a persistence to the length of the palate. This is seen in all its intensity in the Clover Hill Cuvée Exceptionnelle Rosé: a sparkling wine almost purely comprised from Pinot Noir. Pinot Meunier is traditionally the smallest component of the sparkling blend, but is recognised for its large impact. Lighter in colour and larger in berry size, Pinot Meunier imparts complex aromas and flavours that are more characteristic of aged wines, giving floral, fruit, spice and earthy tones to the sparkling wines. In contrast to the other varietals, Pinot Meunier is often perceived as a rapid ageing component, which further enriches the flavours it already imparts. When blended well, it complements the other principle varieties perfectly. Visit the Clover Hill Piper’s River vineyard, in the Tamar Valley Wine Route. Open to the public from late 2017.